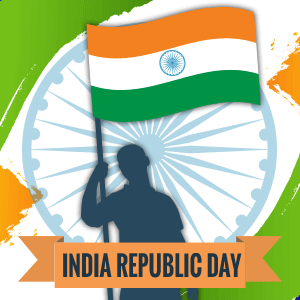 Indian Republic Day honors the Republic of India and the existence of the Constitution of India. On this memorable day, India’s rich cultural heritage and prowess of the armed forces is showcased to the world amidst much fanfare. Which Republic Day we are celebrating in 2019? India celebrates its 70th Republic Day this year and it is a national holiday across the country. Indian republic day is celebrated each year on 26th January commemorating the day when India officially became a republic and the Indian Constitution was officially enforced. It is one of the most important days in Indian history and is celebrated nationwide as a National Holiday. Republic is derived from a Latin word ‘Res Respublica’ which signifies a state in which the power is in the hands of the people who choose their elected representatives and which has an elected President instead of a monarch. India became the largest democracy on 26th January 1950 when the Constitution Of India was officially adopted. Although India attained its independence on 15th August 1947, it was more like a symbolic win as our country was still ruled by the archaic Constitution framed by the British. The real victory was attained on 26th January 1950 when India’s independent Constitution came into existence. The importance of Republic Day lies in the fact India became independent in the true sense on this day. A drafting committee with Dr. B.R. Ambedkar as its Chairman presented the first draft of the Indian Constitution on 4th November 1947. The Assembly met over a span of two years and certain amendments in the draft were made. The process was finally completed on 26th January 1950 when the Constitution Of India was finally framed and adopted by the Assembly. It was signed by all the members of the Assembly and came into effect in the entire country on this day. It was celebrated as India’s first Republic Day. On this day, Dr. Rajendra Prasad took oath as independent India’s first President at Durbar Hall, Delhi. He then hoisted the National Flag at Irwin Stadium which was then followed by a 21 gun salute. From this day onwards, the tradition of flag hoisting and 26th January parade commenced. Similar to the past years, Republic day will be observed and celebrated with much vigor and enthusiasm on 26th January 2019. It is an Indian National Holiday across the country. People from the smallest part of the nation are glued to their television to witness the grand and colorful 26th January parade. Every Indian takes pride in the rich heritage and pays their respect and tribute to the strong armed forces of the country. The main celebration of Republic day is held at Rajpath in the national capital of New Delhi. Several ceremonious and colorful parades celebrating the unity in diversity of different Indian cultures mark the Republic Day Celebration. The celebration is presided by the President of India who hoists the national flag on this day. 26th January speech is another major attraction of the event with which the President of India addresses the entire nation. The parade is a beautiful exhibit of India’s defence capacity and cultural grandeur. On Republic Day, brave soldiers from the Defence forces are conferred with prestigious awards such as Kirti Chakra and Ashok Chakra by the President Of India. The entire country on the occasion of Republic Day is beautified with the color of patriotism. Streets are filled with the tricolor, patriotic songs and stories of India’s independence struggle. The festivities of Indian Republic Day are concluded by the Beating Retreat ceremony which takes place on 29th January. This ceremony is chaired by the President Of India and is performed by the three wings of defence - Army, Navy and Air Force.